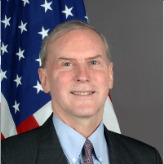 Veteran diplomat Stephen M. Young was born in Washington, D.C., and grew up in New Hampshire. He also lived in Kaohsiung, Taiwan, in 1963, when his father served as a military adviser to the Republic of China. Young received a bachelor’s degree in history from Wesleyan University in 1973. The University of Chicago awarded him a master’s degree and a doctorate in the same discipline in 1974 and 1980, respectively. He entered the Foreign Service the same year he received his doctorate, serving as director of the Office of Caucasus and Central Asian Affairs in the State Department and as desk officer at the Russian Desk. Some of his initial overseas assignments included two stints in Moscow and one in Beijing. Young was assigned to the American Institute in Taiwan as deputy director between 1998 and 2001. He went on to become director of the State Department’s Office of Pakistan, Afghanistan and Bangladesh Affairs in the South Asian Bureau. From 2002 to 2003, he directed the Office of Chinese and Mongolian Affairs in the East Asian and Pacific Bureau. He then served as ambassador to Kyrgyzstan from July 2003 to June 2005. Young assumed the AIT directorship on March 18, 2006. He speaks both Mandarin and Taiwanese.